Update: I have moved into a professional website for the editing/writing and art sales business sides of my life - Ruth - See Editing for more detail on the editing business. Of potential interest to grad students and other research-hounds, I've installed WikiNDX, a reference aggregator and organizer in multi-user mode. You can register, create a database and insert your own references, make notes to yourself about them, and download reference lists in your preferred format. Since I work mainly in APA, the default format is set there, but you may format your lists to your favorite flavor of style manual. Writing and editing are also things I enjoy on a hobby level. I keep an online LiveJournal, and am active on various arts email discussion lists. Drawing, painting, concept- mapping and art techniques of all kinds go along with the sacred quotidien of my written journaling. I thrive in a community that shares ideas, inspiration, and encouragement to try new ways of blending imagery, color and words. Since January of 2003, a handful of art friends have begon to gather, and are working our way through different art forms for pleasure. 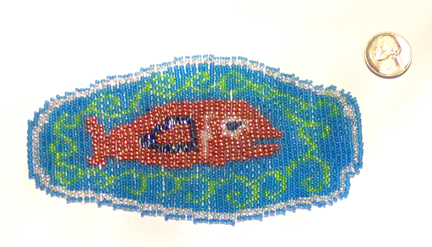 Currently we all seem to be on a bead kick, or rather, we've been joined by an avid beader and everybody's fascinated with wanting to know how she makes the wonders she does, and that's brought in more book-arts and beading mavens! in early August, some of the art gathers group went up the hill to meet with ConText, the Contemporary Textile Artists' Guild, who spent this meeting on Beadmania! 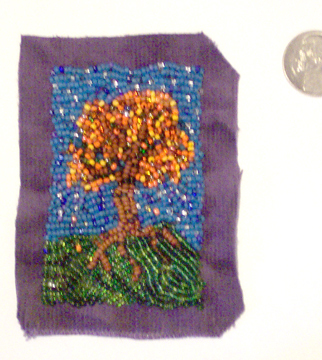 I had wanted to start a bead embroidery piece, and after finding that working on leather is a little tougher than I wanted to spend the effort on, that bead embroidery onto a good cloth backing (I wound up using a scrap of narrow-wale corduroy) works up incredibly fast, and I was delighted to finish this tree the next afternoon! Since the summer of 2002, I've been taking book and paper arts classes at the San Francisco Center for the Book. and have received certification to run the Vandercook presses. I've bought a bit of type (Century Schoolbook font), and am collecting sample texts I think it would be cool to set, and have a chapbook project in mind... on down the road some year. I've also enjoyed meeting the punsters who keep the historical print shop project in San Jose active and alive, and hope to wander down that direction and fossick about in that print shop on occasion. In 2003, I have taken a marbling class and a paste paper class, and results of both of these are showing up in my book-binding, as decorative cover papers. The National Novel Writing Month happens in November each year, and I set me down to Write. A bunch. Every day. The sign-up boards are open, now that it's October: I'm there as RuTemple. This year I'm actually going to mock up and outline a plot, and see where it goes. Go thou and dare yourself! In 2001 my writing turned out to be something journaling can often turn into: a cathartic processing of some personal issues; in 2002, I captured a number of observations and vignettes of Life in San Francisco. And in the next year, who knows? I don't particularly expect to write The Great American Novel, but I do enjoy it as an exercise and always get some useful draft-writing out of it, in any case. Maybe one of these years I'll actually string together an entire 50,000 agglomeration of words during November! I take this challenge as a light amateur, for the mere enjoyment of the writing. In November, 2003, inspired by a housemate about to embark on National Novel Writing Month, Tricia Leach began a project that I hope will go on for years: Art by the Inch. This is a 30-day challenge to set a goal to create a certain number of square inches of artwork (any medium) and to share the process with other artists. "Practice Words," suggests a calligraphy teacher I know. Create lists of words that resonate and practice writing them in your chosen hand... She suggests that one create sample lists including: round words, action words, contemplative words, musical words... Abecediaries, or studies that use all the letters in the alphabet, are also a calligrapher's delight. I am available to letter your invitations, cards, and have even penned out a dance written by a friend as a gift memento for another. One motto I have pinned above my studio desk is "Art Takes Time." In 2003, Ruth has begun publishing a small magazine dedicated to all her various arts and bookish delights. WayzGoose has its own subdomain at this website!